We have been hard at work here at Blu, developing new Reports based on our Customer feedback and improving the functionality of our existing ones. The enhancements include sorting of the output records, consistent multi select filters, large report download capability and performance improvements.We also have a slew of brand new reports, the Monthly and Daily Invoice Graphs, the Usage Activity Report, the Payment Summary graph are a few. The Data the report generates can be sorted by clicking on the Report Headings. So for e.g. by clicking on "Date", you can sort the generated report by most recent or earliest. Amount column may selected to sort the report by ascending or descending order. The red triangle by the side of the heading indicates the column by which the report is being sorted. With the Multi-Select feature available in the drop down menus you can generate flexible reports that will allow you easy and quicker access to complex questions and aid you in your decision making process. For E.g. 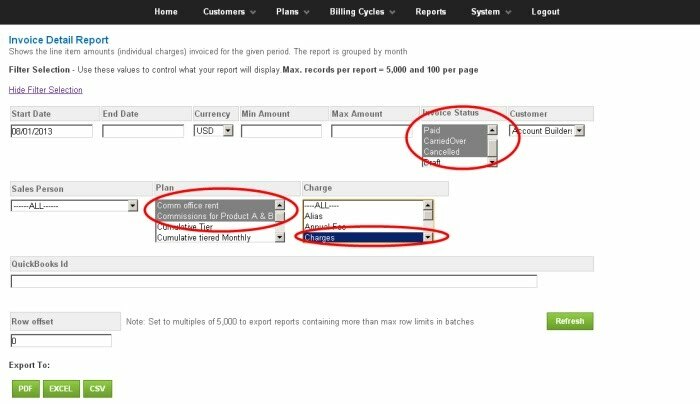 In the pic below, from the Invoice Detail Report you can hold the shift key down and select multiple choices from the drop down menu. The Row Offset feature in the filter selection can be used to download data that exceeds the maximum row limit in batches. This will allow for quicker download of data into the format you desire.